In this week’s match-up we take a look at right-backs Jason Hoffman and Storm Roux. 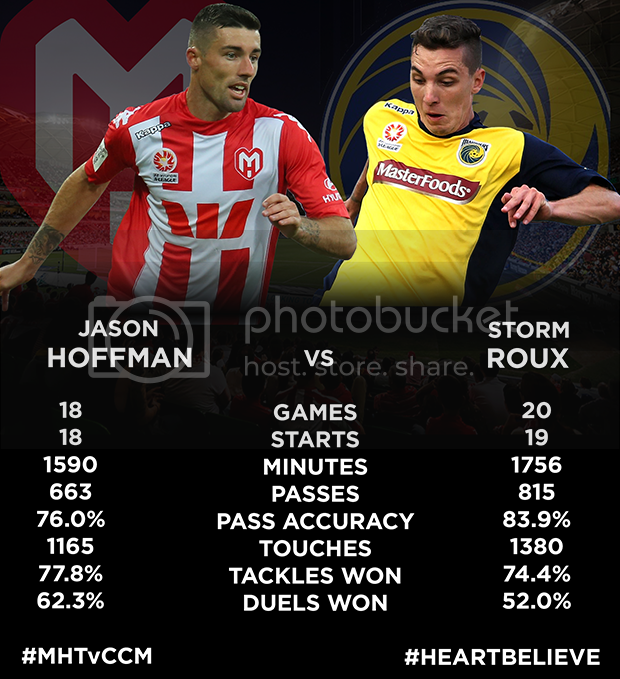 In this week-s match-up we take a look at Melbourne Heart FC right-back Jason Hoffman and his Central Coast Mariners counterpart Storm Roux. Jason Hoffman has been a revelation for Melbourne Heart this season after being switched to the right-back role in pre-season. Hoffman is one of only two inaugural players still at the club, but has normally played further up-front so far in his Melbourne Heart career. His story is similar to that of Aziz Behich, who was originally an attacking player before Head Coach John van-t Schip moved him to the left-back position, where he has played ever since. This weekend Melbourne Heart come up against Central Coast Mariners, who-s right-back has had a stunning season of his own. Storm Roux, 20, was signed from Perth Glory following the U20 World Cup in 2013 and has made a total of 20 appearances for the Mariners this season. His performances earned him a call up to the New Zealand national team, but it was a forgettable experience as the All Whites crashed to a 9-3 aggregate defeat to Mexico in a World Cup play-off. The two have had roughly the same amount of appearances this season and share similar stats in a number of key areas. In football, full-backs are normally the players with the most involvement in a game in terms of touches, passes and time in possession, especially with a side that likes to play out from the goalkeeper. Hoffman in his 18 starts has had a total of 1165 touches so far this season, compared to Roux-s 1380 in 19 starts. Roux has also had more passes (815) with an impressive passing accuracy of 83.9%, with Hoffman notching up 663 passes with an accuracy of 76%. Hoffman has been involved in more duels than any other Heart defender (212), winning 62.3% of those, which is also the highest by any Heart player with 50 or more duels. Roux has been in 200 duels, but with a winning percentage of only 52%. Hoffman also has a higher percentage of tackles won, with a winning percentage of 77.8% percent from 67 tackles compared to Roux-s 74.4% from 58 tackles. In terms of fair play Roux has only picked up one yellow card all season compared to Hoffman-s four. Hoffman has also conceded a total of 28 fouls in comparison to Roux-s 23. Head down to AAMI Park on Sunday afternoon to see who comes out on top. Kick-off is at 3pm.